About a year ago, I invested in a set of really good reusable bags. Not your average $1 reusable bags, the ones I bought are made to last. They're a matching animal set from Envirosax. Designed to hold over 40 pounds, they are durable, cute, and roll up so tiny that I can carry two spares in my purse. I adore them. I've given them as gifts to loved ones, and have even purchased a set for my husband's car. I'm devoted to using bags that aren't plastic. I always try to remember to pull one out, even at places like the pharmacy, although I admit there are occasions I forget. Most days, though, I have my bags with me and am prepared to use them, even though it might take the cashier just a little bit longer, especially when I have a lot of stuff. I take good care of them, making sure I wash them after use. So with all this effort, it's important to me that I'm not carelessly adding plastic to the landfills. Which is why when I get to the grocery store I'm always hoping for an efficient bagger. One that isn't afraid to fill them to the brim, that doesn't feel the need to double bag my onions in harmful plastic so they don't get onion peels in my bags (hey, look, they're clean, that means I don't mind washing them!). I realize their intent, while environmentally naive, is well-meant. Last weekend, though, I had the worst checker I'd ever had. Oh, she was nice and all. She just couldn't bag for anything! I'd brought in 4 of my Envirosax, and over time I've become quite accomplished at being able to eyeball a cart and know exactly how many bags I need. If I have more than I can bag, I stop shopping (seriously). Anyhow, this checker kept putting two items in a bag and handing it over. While she chatted on about how busy they'd been that day, I secretly redistributed the items into another bag and slyly placed the empty bag back on the kiosk for her to fill again. I never said anything. I remember what it was like to be a cashier from a stint in college at Toys R Us; I still recall dealing with lousy shifts, disgruntled customers, and micromanaging bosses. The last thing you need is some bossy customer trying to tell you how to bag groceries. Even if they say it nicely. So I continued to try to redistribute and shuffle bags back as quickly as I could without her noticing, but she got into the plastic bags anyhow. The horrors! Twice I emptied plastic bags and slid them back empty onto the holders. Yet I still ended up with four plastic bags (half full) and four reusable bags (half full) in my cart. I told the cashier that I hoped her afternoon was quieter than the morning had been. And I went on my way, knowing that we would reuse the plastic bags at least once before sending them on to a landfill. There was still a part of me, though, that felt awfully bad about those plastic bags, although I think it was good I left her alone to do her job. I'm sure you're thinking - four plastic bags? That's such a small thing. And it is a small thing, but I feel like not using plastic bags is a tiny way I'm making a difference in my daily life. Yes, a part of me kept saying on the way home, but it matters to me. The plastic bags matter to me. Readers, when you feel really passionate about something, do you say anything? Linking up today with Pour Your Heart Out. I admire your commitment! I always remember to bring my reusable grocery bags, but I really need to invest in reusable sandwich bags, etc., for school lunches. I shudder to think at the accumulated waste of the year. Thanks for the inspiration! As for your four plastic bags, I don't know if they do this everywhere, but I've definitely seen grocery stores where you can return your (un-torn) plastic bags after you use them. Maybe you could try something like that? I don't like hurting peoples feeling so I probably wouldn't of said anything either. I have been forgetting to bring my reusable bags and now have tons of plastic bags. I need to be better about it. You're gonna hate me now, but I almost always forget my re-usable bags (the $1 variety) when I go grocery shopping. Maybe I need to get a few that are fun and colorful or something to catch my eye. All I know is I'm feeling guilty just now and I really want to do better! :) Still friends? I just bought a book that has patterns for things you knit and crochet out of "plarn". Short for plastic yarn, which means you cut a plastic bag into one long strip and then knit or crochet multiple bag strips into a placemat, permanent shopping bag, trashcan, coasters, bathmat, etc. The shopping bags and trashcan are really cute. Yes -- but a totally different subject. My brother in law sent me an email about a politician I don't particularly care for and I emailed him back, letting him know. He's prolly p.o. 'd at me, but what the heck? I have reusable bags, but often forget to bring them. I need to be better about that. Wow! I can't believe you have baggers at your stores. They are a thing of the past here. I think you handled it really well, Lisa and I admire your commitment. Being gracious to others is more important, I think. We're picky about what we eat at home, but would never say anything to someone hosting us because that friendship is so much more important. I can relate to your guilt, however. Sometimes when it's midnight and I'm STILL CLEANING and the trash can happens to be closer than the recycling bin, that piece of paper I've been stepping on for days gets tossed. Regarding plastic bags, I try to recycle or reuse them if I happen to come home with any, and sometimes if I have a big item and not enough reusable bags, I quickly tell the cashier that I don't need a bag for it. I haven't purchased any reusable bags personally, however I do admire the ones who have and it irks me when the sales people give them problems for bringing their own in. On many occasions I've seen them just bypass the ones the person brought in favor of their breakable ones and they just keep doing it. Eventually I think we'll all be on the same page. I find I speak out more that I used to about things like like that.Usually I try to find a nice way to do it. Sometimes though,I do get a little spun up,lol! thankfully, our little grocer has a recycle bin for plastic bags and i always throw my extras in there - hoping, at least, they'll go around again. I recycle the plastic bags, but like to take them and reuse them. I clicked your link on the hop because I just published a post that included reusable bags as part of the topic. Your very good about your bags usage. I intend to become better! I think you should have politely asked her to use your bags and explained to her the amount of weight they would hold. I assume she was young and you may have influenced her to think green. Lisa-I can see why the four bags upset you too. It's because you are passionate about the environment! I think of all of the folks still taking plastic bags-dozens each week, and how it adds of to tons of plastic bags that can end up in the landfill. 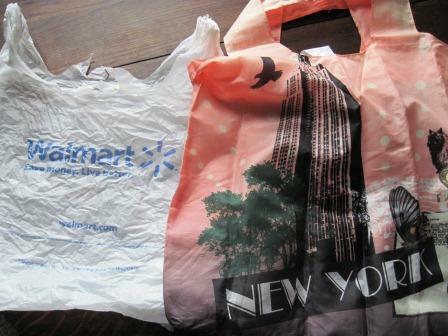 I return all of my plastic bags to either Wal-Mart or Kroger, depending on where I am going. They have nice big recycle containes for them at both stores, so I don't have to feel guilty. I also use a few cloth bags, but they tend to get dog hair on them when in the back of my vehicle because sometimes I also haul the pups back there. Then when I use them at the grocery store I get dog hair on the counters... ewwww. So, cloth bags just don't work for me all the time. It depends on the situation and who I'm talking to. I'm passionate about animals and animal welfare, and sometimes people say some ill-informed or mean things about animals. If I know the people, I'll usually say something but try to be respectful. We get plastic bags, but we do so because we use them for used kitty litter. We really need to find another way to deal with the issue. We do recycle a lot. My husband is King of Recycling. He will dig a piece of plastic out of the trash can if I've forgotten and thrown it away. What I really need to work on is my consumption of water bottles. We recycle them, but it's still plastic being used. Don't get me started!!!!! I prefer bagging myself for sure!!! With someone else bagging, I have had foods completely ruined and had to toss them. I will at times tell them that I prefer to bag myself, but some places won't let you! Now we shop at a store that you scan and bag yourself, but at times we still have to go to the other kind. When they don't bag it right, I wheel the cart away, and then re-bag when they are not looking, I do not want to complain. I have almost bought the EnviorSax, I will need to get some, I love everything I have heard about them. And with my own bags, the stores are more likely to let me do the bagging myself. By that same token, I hate it when a bagger puts so much stuff into a bag that I can hardly lift it. I have lots of bags and often they will fill three or four bags to the brim, but leave another 2 empty, or just place one or two items in them. I feel good that I have recycled all of the plastic bags in my shameful mountain of bags that took over my closet. I have been good about using reusables, but I had been reusing the plastic bags as trash can liners and now I run out. I'm curious, do you use anything to line your trash cans? My parents use to use paper grocery bags for that. I know how you felt and can understand. You did the right thing! We use reusable bags wherever we go or at least we try. Every time I use my bags--I keep a good-sized spare in the momvan and if I forget, I carry out my goods IN MY BARE HANDS! It pleases me that a few stores around here aren't automatically putting small purchases in bags. I wish more would. Such a frickin' messy waste. I am passionate about my bags too. I have a trunk full and I always tell them pack them heavy. I even put things on the conveyor belt in a way that should make them easy to pack. We say "No, thanks; we can do it" and bag our own more often than not. Our cashiers appreciate it most of the time, as long as we can keep up. If they do have to help us, we watch for them reaching for the plastic so we can forestall them by saying, "Oh, no, use this please." Usually this double-whammy convinces them not to use plastic without asking. I was a grocery store cashier through high school and my last year there was when plastic bags made their "debut". I hated plastic bags then and still hate them today. I sewed up a bunch of cloth bags to use and have them stuffed in everyone's vehicle too haha. She probably wouldn't have gotten it anyway, you know? Not always worth speaking up. Though I do now feel a little guilty since I usually use plastic bags.